Hennessey Performance Engineering is known for transforming all sorts of vehicles into unique creations that are downright monsters. The Texas-based firm’s clients include big names like Post Malone, and the latest celeb to purchase a Hennessey-tuned vehicle is Dwayne “The Rock” Johnson. The former athlete turned actor and director has opted for a Ford F-150 Raptor that’s been modified and redesigned into what Hennessey calls the VelociRaptor V8. No, The Rock didn’t get the VelociRaptor 6×6 that Post Malone bought for Christmas. In the case of the truck, the 6×6 designation comes as a result of an extra set of wheels installed on the truck as part of the build by way of a third axle, thereby transforming the truck into a 6-wheeled beast. 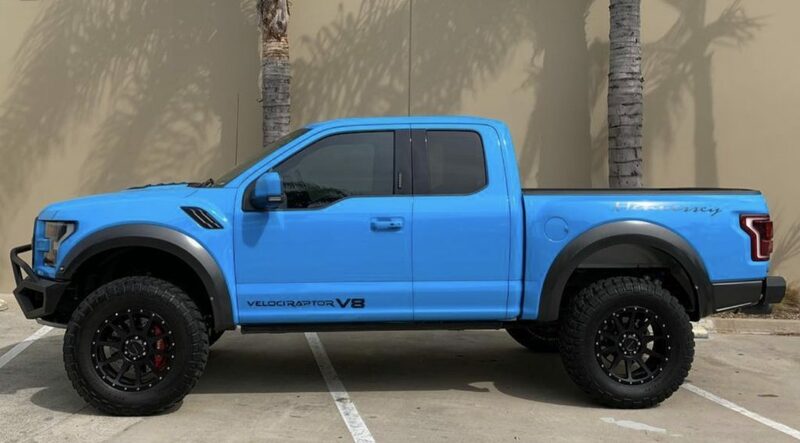 Instead, Mr. Johnson bought a standard VelociRaptor V8 in a rather unique blue color. Hennessey’s post on Facebook refers to The Rock’s new ride as a “baller wagon”, without providing any additional information about the truck. Even so, the vehicle appears to be a standard VelociRaptor V8. The color is particularly interesting, as we have not seen this shade of blue on an F-150 Raptor. 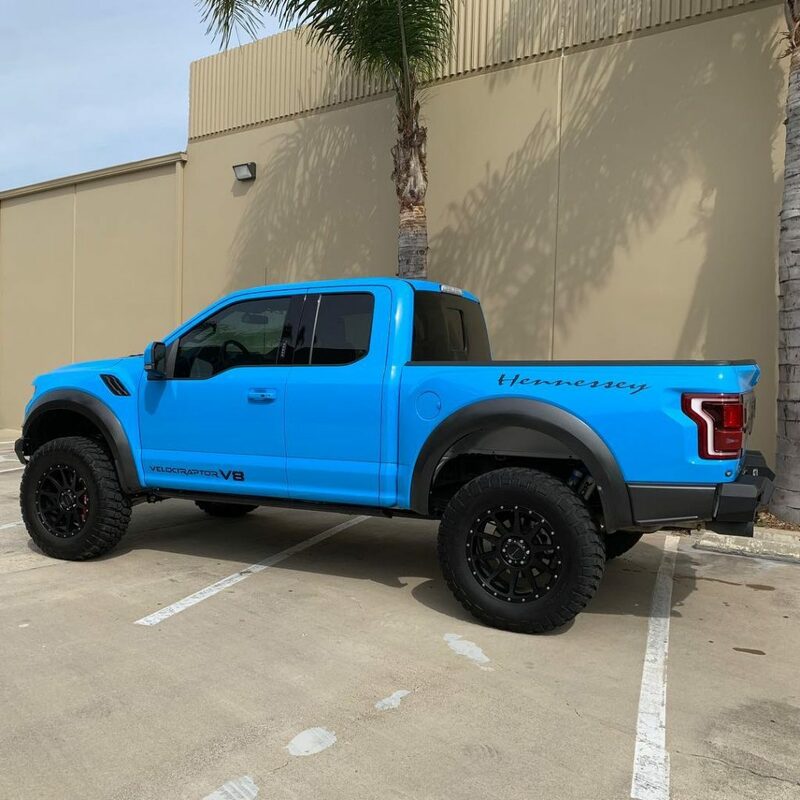 It’s not one of the two blue colors – Velocity Blue or Performance Blue – currently offered by Ford on the F-150 Raptor from the factory, but it does resemble the Grabber Blue color previously offered on the Ford Mustang. The Hennessey VelociRaptor V8 starts off as a “regular” Ford F-150 Raptor. It then gets a heart transplant that swaps the factory-installed, high-output 3.5 EcoBoost V6 engine with Ford’s 5.0-liter Coyote V8. A supercharger is then added to round out the package. With the new powerplant, the truck makes 758 horsepower that enables it to do zero to 60 mph in 4.1 seconds. Subscribe to Ford Authority for more Ford F-150 Raptor news, Ford Truck news and around-the-clock Ford news coverage. Nice, looks like Voodoo or Mexico Blue, or maybe even Riviera, all Porsche colors.